We get to read the Easter story today and finish the book of Matthew with Matthew 27-28. Judas hangs himself after betraying Jesus. Jesus is mocked, tortured, and crucified with criminals. And then, finally, the Good News, Jesus rises from the dead. Exactly what Jesus said would happen, happens right before our eyes. He is truth. I think about how excruciating Jesus' pain must have been, both physically and mentally. God gave His Son so that our sins are forgiven forever. Do I really understand what that means? I don't think so, but I know it is an amazing sacrifice because of God's deep love for me (and you). 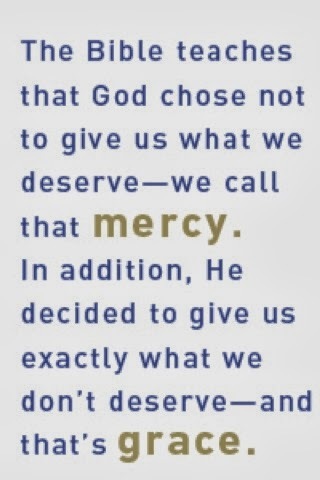 The words "mercy" and "grace" come to life. One of my favorite faith resources is In Touch Ministries. I love the way they define mercy and grace so simply (illustration on the right). If you are interested in a more detailed explanation of what God's mercy and grace mean for us as Christians, I found some good answers at Gotquestions.org. Instead of the punishment we deserve, we are blessed with God's extravagant and unconditional love, which we don't deserve. Because Jesus died for us, there is nothing that stands in the way of our own personal relationship with God. We have a direct line to our Heavenly Father. 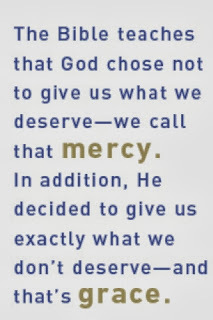 Thank you for your mercy and grace. You love me beyond measure. You bless me, forgive me, and save me. Yet, I still build walls that separate me from You. God, help me tear down those walls. And as I go through each day, guide me in loving others with your mercy and grace. I pray others will experience your amazing love through me and draw closer to you.